At the Lutte Ouvrière Fête outside Paris in May we had some rather strange “discussions,” if you can call them that, with leading spokesmen and members of the International Communist League (ICL). As we were standing there with our supplement to The Internationalist headlined “Back to Trotskyism,” we were accosted by a fellow screaming over and over that we are “bleeding-heart liberals.” If we call for letting refugees into the EU (European Union), he said, all of Africa would want to come in. Not recognizing him at first, we thought he might be some kind of right-wing immigrant-basher who somehow got into that kermesse of the reformist left. But it soon turned out that he was a long-time member of the ICL, and this was only the foretaste of our exchanges that lasted, off and on, for the next two days. Close encounters of the fourth kind, you might say, weirder even than the 1977 movie about meeting extraterrestrials. Trying to bring the exchange back to earth, we said “But what about the Syrian refugees? 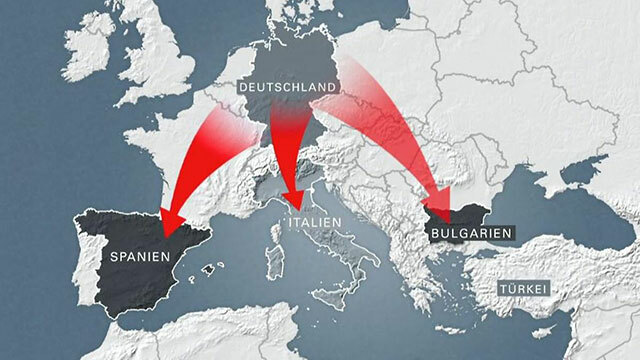 There are several hundred thousand banging on Europe’s doors right now, what do you say to them?” The response, by Len Meyers, editor of English-language Spartacist, to Jan Norden, editor of The Internationalist, was: “Oh, so you and [German chancellor Angela] Merkel are going to save all the Syrian refugees, is that it?” To this astounding statement, our response was that, of course Merkel was letting in Syrian refugees for her own imperialist purposes, but here the ICL was siding with right-wing anti-immigrant forces in Germany. We asked, what about the Syrians amassed on the Turkish coast seeking to enter Europe, what are they supposed to do? After trying to obfuscate by saying there were also Afghans and even Pakistanis among them, the response was finally that they could stay and fight at home. Fight in Syria – for whom? According to the ICL’s line, Syrian Kurds (and others) should militarily side with the Islamic State, which would massacre them. Digesting the arguments by the ICL spokesman, we came back to this some time later, asking what about the Greek soldiers who announced they were refusing to carry out anti-immigrant orders on the border between Thrace and Turkey? (See our article, “General Strikes Are Back in Greece: Revolutionary Leadership Needed,” The Internationalist No. 42, January-February 2016). If they refused to round up refugees trying to get into Greece, or helped them make it through the fence, would that be supporting “humanitarian imperialism”? All the ICLers would say was that if the refugees managed to get through, then they should have citizenship. But what about the Greeks who helped pull refugees out of the water in Lesbos, is that aiding imperialism? No answer. For the ICL, the idea of workers’ action in support of refugees trying to get across the border would be denounced as “open borders liberalism.” For genuine Trotskyists, such action would be welcomed as a refreshing expression of international solidarity, and an act of elementary human decency. Another ICL zinger was to claim that our call for “Full citizenship for all immigrants and refugees!” was saying that an immigrant living in France should have citizenship in Germany. And so it went, each argument more absurd or reactionary than the last. In reality, a main purpose of the brouhaha over refugees was to deflect the BLTN Faction Declaration’s challenge to the ICL over who led the counterrevolution in East Germany and the Soviet Union: the imperialists (as the ICL correctly said at the time) or the Stalinists (as it later claimed in the course of its 1996 expulsion of the founders of the LFI, and then codified in its Declaration of Principles). “The Kremlin bureaucrats,” insisted Meyers, while others said “the imperialists, of course.” A week earlier at May Day in New York City the ICL’s diversionary ploy was to accuse the LFI and our Brazilian section of supporting the popular front (even though our headline explicitly said “no political support to the popular-front government”) for our opposition to the right-wing impeachment drive spearheading a capitalist attack on the working class (see “SL/ICL Impeached By Its Own Past,” The Internationalist No. 44, Summer 2016). After objections from SL national chairman Jim Robertson, a May 28 motion of the ICL’s International Secretariat decreed that that this amounted to “a reactionary utopian ‘open the borders’ line, reflecting a species of humanitarian liberalism. The articles eliminated the distinction between immigrants who have made it to a country and those who have not. Additionally, the EU article pushed calls that amounted to a ‘social Europe’.” As so often with the SL/ICL, the frenzy of their denunciations of the Internationalist Group/LFI is partly because they are polemicizing against themselves. Did this just apply to refugees who had “made it here”? No. Was this promoting illusions in “humanitarian imperialism”? Did this mean that the entire population of the Caribbean or Central America would move to the U.S.? Hardly. Similarly, to justify its current keep-the-refugees-out position, the ICL has redefined “refugee.” “For us, ‘refugees’ is a political term, used to refer to victims of right-wing terror” (as Eibhlin McDonald, leader of the British section put it in a 27 May 2015 document). Spartacist editor Meyers argued (in a 16 July 2015 document) that “those fleeing ‘the dislocations of war’ are not refugees in any politically meaningful sense, but rather ‘displaced persons’.” Breathtaking. “Displaced Persons” was used to describe the infamous “DP camps” where Jews who had survived the Holocaust were held and prevented from entering the United States. The term “displaced persons” was invented in order to deny them the status of refugees with certain supposed legal rights. 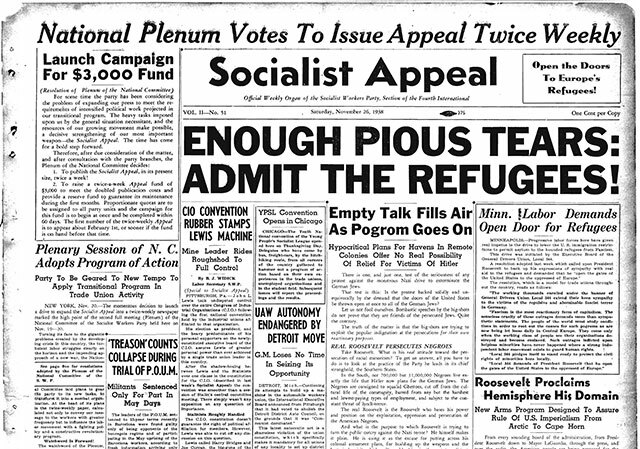 The Displaced Persons Act of 1948 was so anti-Semitic that President Truman said in signing it that “this bill is flagrantly discriminatory” and “excludes Jewish displaced persons.” This exclusionary term is now apparently the ICL’s preferred designation because “refugee” implies a right to asylum, which it now refuses to call for. We might add that when the refugee issue came up again inside the ICL a few months later, Meyers wrote (5 October 2015): “The vast majority of those seeking entry into EU countries (or the U.S.) are simply seeking a better, safer life. We sympathize with their plight. But we know the answer to their problems does not lie in trying to move from country to country but in fighting the capitalist exploiters wherever they are.” This is the same line he spouted at the L.O. Fête, that instead of fleeing they could (should) fight at home. In the previous sentence of the same document, in order to buttress his argument that there is no “right to asylum in … the country of one’s choice,” he refers to the famous case of 900 Jews aboard the steamship St. Louis who were refused entry by Cuba, the U.S. and Canada in 1939. Yet the fact that they wanted to come to the U.S. and were refused was an atrocity. One wonders: Does he perhaps think that instead of calling, as the SWP did in 1939, for a “free and unrestricted right of asylum” it should have told them they should go back and fight Hitler in Germany? No doubt Syrian refugees will be duly appreciative of the ICL’s empty “sympathy” for their “plight.” Sympathy, but no asylum. Down with the Dublin III Deportation Decree! The fight over immigration and asylum resurfaced in the ICL in September 2015 when some members of its German section, the SpAD, objected to a polemic in a draft Spartakist article criticizing RIO (Revolutionäre Internationale Organisation, affiliated with the Fracción Trotskista led by the Argentine PTS), Arbeitermacht (Workers Power, the sister organization of the Red Flag Platform of the British Labour Party) and the SAV (part of the Committee for a Workers International [CWI] led by Peter Taaffe) not only for their liberal utopian call for “open borders” but also for opposing the EU’s Dublin III provisions. As we have noted, Dublin III (officially EU Regulation 604/2013) mandates that refugees requesting asylum be processed in the first EU country they enter, thus laying the basis for those who make it to northern Europe to be “transferred” back to Greece or Italy, to be jailed prior to being deported. Dublin III is a “fast track deportation” provision, which revolutionary Marxists must clearly oppose just as we oppose deportations of immigrants and refugees overall. Yet Workers Vanguard (No. 1077, 30 October 2015), the “flagship newspaper” of the ICL, criticized the CWI for calling to end Dublin III, and proclaimed: “Marxists do not take a position on refugee ‘burden sharing’ between capitalist governments.” Internally, Spartacist League/Britain leader McDonald put it more bluntly: it is not the ICL’s “business to get involved in which country immigrants and asylum seekers are sent to” (27 May 2015). So if someone is picked up and “sent” (deported) to another EU state, that’s “none of our business” for these pretend Trotskyists? The WV 1077 article goes on to claim, “Rather, we oppose all deportations, irrespective of their legal basis.” But in refusing to oppose Dublin III, the ICL accepts the “legal basis” used by the bourgeoisie to keep refugees out of northern European countries and to terrorize (as well as deport) those who make it there. This is in line with its denunciation of calls for “cancellation of the anti-immigrant laws” (in Spartaco, April 2016). In contrast, the LFI calls for workers action to prevent all deportations, and also to oppose all racist and discriminatory immigration laws as the ICL did in the past. Moreover, the ICL’s current refusal to oppose Dublin III contradicts the program it fought for when it based itself on revolutionary Trotskyism. In 1992-93 the German parliament voted the “asylum compromise” between Christian Democrats, Free Democrats and Social Democrats which gutted the previous law upholding the unlimited right of refugees to asylum that had been written into the constitutions of both the Federal Republic of Germany and the DDR (East Germany). Henceforth, any refugee arriving from another EU country or “secure” third country would be ineligible for asylum, and could be expelled from Germany. Dublin III is simply the acceptance by the rest of the EU of the German law. During the “asylum debate,” Spartakist headlined “Workers: Defend Immigrants and the Right to Asylum!” (May 1992) and “Racist Popular Front Seeks to Destroy the Right to Asylum!” (November-December 1992) with a photo of an SpAD banner demanding “Full Citizenship Rights for Immigrant Workers and Families.” Under the new law, less than 2% of all applications for asylum were recognized. In response to the calls by dissident ICL members in Germany and Britain to oppose Dublin III, the ICL leadership declared that this “partakes of the social-democratic framework of a kinder, gentler Europe and buys into the liberal myth of ‘open borders’ between states that have signed the Schengen agreement” (I.S. motion, 20 October 2015). Simultaneously, as repeated in the article in Spartaco (April 2016), it opposed calls for “freedom of travel within the EU” for immigrants as likewise equivalent to calling for “open borders,” even though non-immigrant citizens are able to do so. In short, the ICL’s turn over the last year to refusing to call for the right to asylum for refugees and its opposition to calls to oppose the Dublin III deportation regime and in favor of refugees’ right to freedom of travel in the EU, all contradict its purported support for citizenship rights for all immigrants. What exactly “full citizenship rights” even mean in the eyes of the latter-day ICL is anybody’s guess. McDonald castigates the pulled Workers Vanguard draft for “ridiculously deluded demands on the EU imperialists, including that the ‘welfare state’ should be applied to immigrants” (27 May 2015). So “citizenship rights,” but no health care? In fact, the ICL’s new line is a capitulation to anti-immigrant chauvinism, amid a crisis which has dramatically escalated such sentiment. By focusing exclusively on opposition to the liberal bourgeois illusion of “open borders” under capitalism, in practice it has allied itself with the most retrograde xenophobic elements. It is instructive to read the self-criticisms and self-serving explanations by the various actors in the ICL psychodrama as to why they (horrors!) 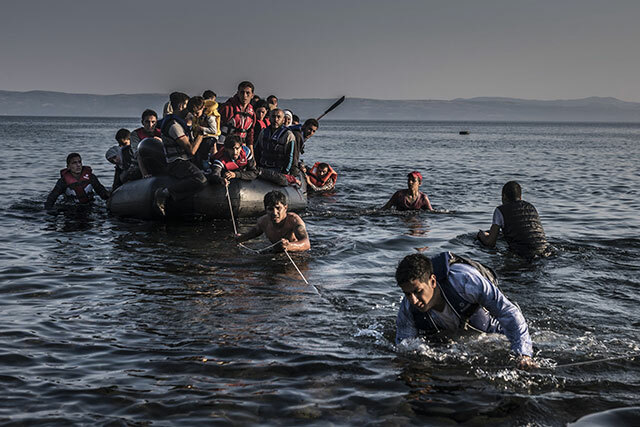 were about to publish a call for asylum for those fleeing Middle Eastern wars. WV editorial board member Alan Wilde wrote (30 May 2015) that in adopting a line of “let them in” they would “replace the necessity of proletarian revolution and working-class power with social-work do-goodism.” Another cadre, R., wrote (27 May 2015): “I thought, where would you draw the line? When people get into the boats? When they reach Libya? Or before that?” McDonald referred (27 May 2015) to the desire to address “people in the boats, who were drowning by the thousands, or to those who are waiting to get on boats to try and get to Europe. One of the pressures towards liberalism comes from not wanting to be seen as ‘indifferent’ to the plight of desperate refugees. But we could do a bit better at withstanding this pressure.” She should rest easy, the ICL has gotten pretty good at that (being seen as indifferent to the refugees’ fate). But authentic Trotskyists have a different task, of mobilizing the working class to defend the oppressed. So if they had been harder-hearted about the fate of earthquake victims they wouldn’t have ended up embracing the U.S. Army as humanitarian saviors?! This is a cynical after-the-fact rationalization and cover-up for their social-imperialist betrayal. The reason for it was the ICL’s growing capitulation to its own imperialist rulers – from dropping the demand for independence for Puerto Rico in 1998 (and later the French colonies of Guadeloupe and Martinique) to dropping the call for defeat of one’s own imperialism in war post 9/11. 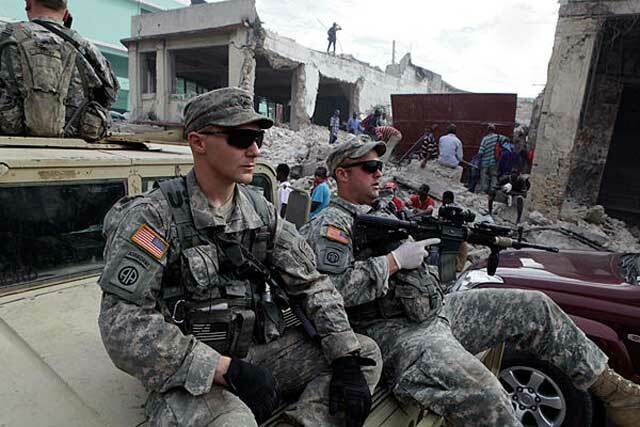 At the time of the ICL’s “savage indictment” of its line on Haiti, we wrote that “for those who do not wish to keep on gyrating in centrist confusion while insisting they ‘are’ the revolutionary leadership, there must be a thorough-going search for the causes of the betrayal. Those genuinely looking for the roots of the SL’s pro-imperialist ‘politics of the possible’ over Haiti would do well to examine the real record of its adaptations and capitulations to ‘its own’ bourgeoisie over the past years” (see “Open Letter from the Internationalist Group to the Spartacist League and ICL,” in The Internationalist No. 31, May 2010). Having failed to carry out such an examination of the roots of its betrayal on Haiti, the ICL was condemned to repeat it – which it is now doing, lining up with the most retrograde elements of the bourgeoisie, including fascists and racists, while hyperventilating about the dangers of “open borders” and “unlimited mass migration” in order to justify not calling to let Syrian refugees in. Members of the ICL should ask themselves if they really want to say to refugees in rubber dinghies off Lesbos island in Greece that they are not refugees but “displaced persons” who have no right to enter Fortress Europe; to tell Agyemin from Ghana and Mohammad from Gambia held in a “welcome camp” in Sicily (“Displaced Again and Again, Some African Migrants Had No Plan to Land in Italy,” New York Times, 2 May 2015) it’s of no concern to the ICL that they cannot travel to northern Europe because to call for that would mean “open borders” and threaten Germany or Sweden’s right of self-determination (see “Italy: The Refugee Crisis and Capitalist Barbarism”); to inform the parents of Alan Kurdi (the two-year-old whose body washed up on a beach in Turkey, becoming the icon for the terrible ordeal of Syrian refugees) that they should have stayed in Kobanê and fought on the side of the Islamic State which threatened to massacre the Kurds. If you can say all that and still claim with a straight face to defend full citizenship rights for all immigrants, then the ICL is the place for you.